Yesterday was your four mile walk. Sometimes you go further, sometimes you jog. Every other day you bike, and you go much further then. So you’ve told me. You liked white yesterday. White capris, white t-shirt. White cap with a sailfish on it, that never changes. Your husband bought it for you during the trip to Wilmington that year. Martin, you said. You’re surprised every time you put it on. You wonder why it’s not a problem to wear. What that says about you. The hat you sang to until the sun came up on the day after he pushed off from the pier. You sang to that hat the night before in bed, again. The back entrance is where your walk changes. Muirfield Drive regresses to a featureless spur beyond the automatic gates, two neat lanes ending at Ocean Pond Way, a half mile straight ahead. There are separate entrance and exit gates for cars. To one side is a smaller pedestrian gate. You pressed a button and the gate unlocked. You left your neighborhood, that world. A car approached from Ocean Pond; it passed another leaving. Muirfield has gotten busy lately, you tell me. On either side of the road are swales, which, at this time of year are just partly full of water. On one side of the Drive is a young pine forest; on the other, a berm that borders an untamed pond. The developer has an option on the land on both sides of the road. It’s ‘Phase 4’ now. When built out, it will be called ‘Palencia’. Development has been on hold for years. You’ve told me that this part of your walk is freer, wilder. The openness conspires with the convergence of the two unadorned lanes of macadam in the distance to pull you along. It’s nothing like the neighborhood you leave, with its curving lanes, heavy shade, traffic and manicured properties, the ticking sprinklers and odd gurgling fountain, the delivery trucks, and acquaintances slowing your progress. Beyond the gates the wildlife fairly overwhelms. The birds sing louder, the bugs crowd at times, swirling in dopey coils around your headphones. The air is thick with the pollen of Carolina pine, ragweed spore and sometimes, faint smoke from a farm field burn off. All ushered along with the onshore from Long Bay. Yesterday, between songs, your sneakers made a hollow, plopping sound. You looked up from your playlist. Ahead, there he was. It happens this way every time. 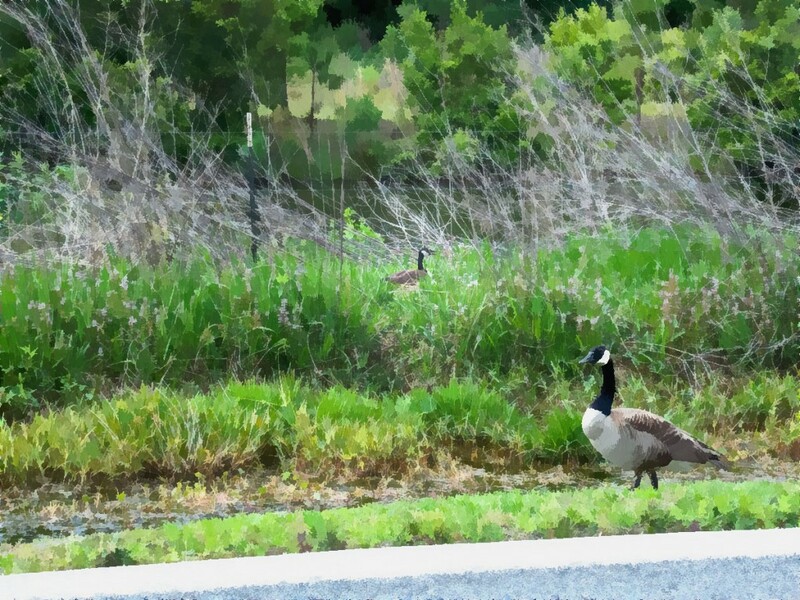 You see this Canada goose at first from a distance, and a hazy angst and grief visit you. How do you not think of him day and night, before and after your walk or ride or jog past this place? His post on the left edge of the road where he’s been a month or more now. Just off the blacktop, mere feet from harm. Your anxiety comes from negotiating his space, finding a distance that will keep you both comfortable. Your grief centers on his mate, missing two weeks now. Before that, they were never more than a dozen feet apart, this young, proud male and his partner. One day, she was gone. This new symmetry was cruelly, starkly upended. And you, Angela, only think of this when you’re nearly upon him each day. You’d clearly prefer to change your route for the rest of this Spring to avoid this, but you never remember to do that. You’ll cross the road to give him a wider berth, and continue to Ocean Pond; forgetting him well before you turn around. You’ll pass him again on the way back, and forget him before you step through the gate on your way home. And the other things that take their place in your thoughts. You told me that it was as if you’d hidden away this and other problems and when you got to this spot each day, you unwrapped them. That day you noticed her gone, you found a solitary feather, a few tufts of down. With their customary efficiency, the Association had no doubt responded quickly and removed all traces of the incident. They prided themselves on their pristine roads and common areas. Both inside the gates, and beyond. Was it a landscaper pulling a trailer, hell-bent to get to the next job? Maybe he aimed for her. Maybe it was his turn at some made up sport, impressing the hired help in his crew cab. Why would you think that, I asked you. It could just as likely have been a blue-hair in a Lexus, late for a tee time. Each time you saw him you’d hope, feebly, that she was nearby, or ‘out’. But where would she possibly have gone? It was your hope, frail and pitiful, against nature’s bleak calculus. Bad odds. Why then, do you hardly think of this when you’re home, you ask me. You make that same mental note every time you pass him to tell Andy and Charisse, at least. And Jackie and the kids. But you’ve spoken to no one else about it. Within a short block, it leaves your mind completely. Until you pass this way again. And that astonishes and troubles you. Television shows have a greater impact on you, you said. Discovery Channel or PBS wanderings through the worlds of hippos, or prairie dogs, or eagles, these were storylines that could hang with you for weeks. Not this. Real nature, when witnessed, fades quickly. Roadkill has no plot. No voice over or music score or sunrise dissolves. Who’s to say there wasn’t a bumper with your name on it riding around Seaside this day? Maybe it’s a defense mechanism, like his. How else could he endure getting up each morning, chasing bugs and sucking algae through his bill, alone? You say you thought of the couple you’d just read about, married 70 years, dying of natural causes, 15 minutes apart. Some people have all the luck. Black holes swallow entire galaxies and baby elephants waste away, mourning at the side of their motionless mothers. Children sometimes don’t come home from a night on the town. Husbands don’t come back from fishing trips. Yesterday, he was sitting entirely on the blacktop, near the edge of the road, yes, but clearly threatened by any car that might pass should they not see him. Or too curious. Or abused in youth. One wing was slightly extended, touching the road, giving him a vaguely convalescent look. The wounded bird ruse, a dodge well known, but still effective. You said you wouldn’t fall for it. You were angry with him. It seemed to you a death wish. “Get off the road!” you shouted. He hissed at you. Then you noticed a movement beyond. Deep in the grass on the berm beyond the swale, behind the thin strand of the wire boundary fence, a head rose on a slender neck. He wanted no part of your dalliance or to share the excitement of your discovery. The male stood, waggling his rump and bristling his feathers. He made a move towards you. You called me from right there in the road. You texted me the picture. I showed you how to make it the wallpaper on your new phone when you got home. You gushed at what masters of deception this pair was, he with his roadside posturing, she hunkered down in the grassy camo of the berm. Your excitement and relief was wonderful and catching. Silly humans. You were glad to play the fool for them, you said. I loved hearing you say that. Today you biked. Your ten mile route. At the last moment, you traded the white sailfish hat for that helmet I bought you but haven’t worn in a year. You had to hunt through the garage to find it. You were thinking of things worth saving, you said, when you dusted it off and put it on. You were excited to see them when you got to the back gate. Not to intrude or gawk, just to bask in these ‘tidings’, was the very word you used, and laugh at yourself. And to report what you’d see to all you’d told. Just past, you saw him. He was a lot closer today, far up the road from where he usually stood. That wasn’t right. He was on his back. His wing stretched out, as if pointing ‘that way’, down the road to her. And where he should be. And the nest. Dew had beaded on his belly. Under his neck. And beak. You said at first you thought he was sleeping.